Easter festival is a highly significant day in the Christian calendar. It is the day when Lord Jesus Christ was resurrected which is primarily the foundation on which the Christian religion was formed. Easter is the celebration of this belief that Lord Jesus was resurrected 3 days after his death. According to the New Testament of Bible, the crucifixion of Jesus was done by the Romans in approximately 30 AD and then after 3 days, he rose from the dead, which is now worldwide celebrated as Easter Day. Easter Sunday and every other festival or day associated to it such as Palm Sunday or Ash Wednesdays are moveable feasts, i.e. they fall on different days every year. As per the Gregorian Calendar, Easter falls on Sunday and usually between 21st March - 25th April. Easter festival commemorates the day when Lord Jesus Christ was restored back to life 3 days after his death at Cavalry. As per the New Testament of Bible, Jesus was arrested by the Romans as he claimed to be the ‘ Son Of God’. He was sentenced to death in Judea, a Roman province. The crucifixion and subsequent death of Jesus happened on a Friday which is now observed as Good Friday by Christians. 3 days later, on Easter Sunday, his resurrection was a testimony to the fact that he was the living ‘Son Of God’. According to the four gospels in the New Testament, everyone who devotedly believes in Lord Jesus’ resurrection will attain the ‘Kingdom of Heaven’ after their death. This gives much more significance and relevance to Easter Day in the Christian religion. Being a religiously important festival, Easter Day is associated with various important traditions. Interestingly, Easter Holiday marks the end of ‘Passion of Christ’ i.e. a series of holidays or events that commence with Lent and conclude with Holy Week. Lent is a 40 Day period of penance and fasting which begins on Palm Wednesday. Holy Week, on the other hand, is the last week prior to Easter Sunday; it commences on Palm Sunday and includes Holy Thursday (when Jesus had his Last Supper along with his 12 apostles), Good Friday and Easter Sunday. Palm Sunday celebrates the arrival of Lord Jesus Christ in Jerusalem. As the legend has it, people laid palm leaves all across the street in order to welcome him. Easter Vigil is another interesting aspect of this festival when several Churches commence the Easter observance services in the late hours. Easter Bunny is an interesting character, who on Easter Day, delivers candies and chocolates to children in all nearby households. The inclusion of a Bunny in Easter celebrations is due to the fact that rabbits are considered to be active procreators so they somewhere symbolize renewal and birth. 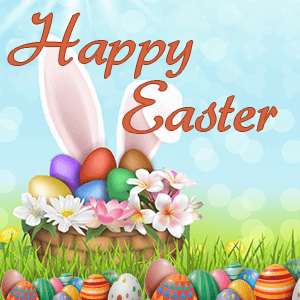 Easter which was initially a religious festival has now become a colorful and joyous festivity with people exchanging greetings, cards and gifts on this day along with relishing on some sweet treats including candies and chocolate eggs. mPanchang wishes you a happy Easter Day! !